* How To Get Your Hands on a Neanderthal Skull: Did the guys just stumble upon the most informative interview ever in the history of the study of Neanderthals? In the year 2000, television and radio teacher D. James Kennedy conducted a groundbreaking interview on the subject. But by producing today's program in 2014, Real Science Radio hosts Bob Enyart and Fred Williams get to incorporate the latest genetic research while interviewing Dr. Jack Cuozzo, the jaw and teeth expert who has studied firsthand and x-rayed more Neanderthal skulls than anyone else, ever. For part 2 of Dr Cuozzo's interview, click here. * Neanderthals took Aspirin and Penicillin: Aches and pains? According to a 2017 paper in the journal Nature, Neanderthals chewed on poplar bark. And a throat infection? Research indicates they ate moldy bread to treat various ailments. * DNA Doesn't Lie! 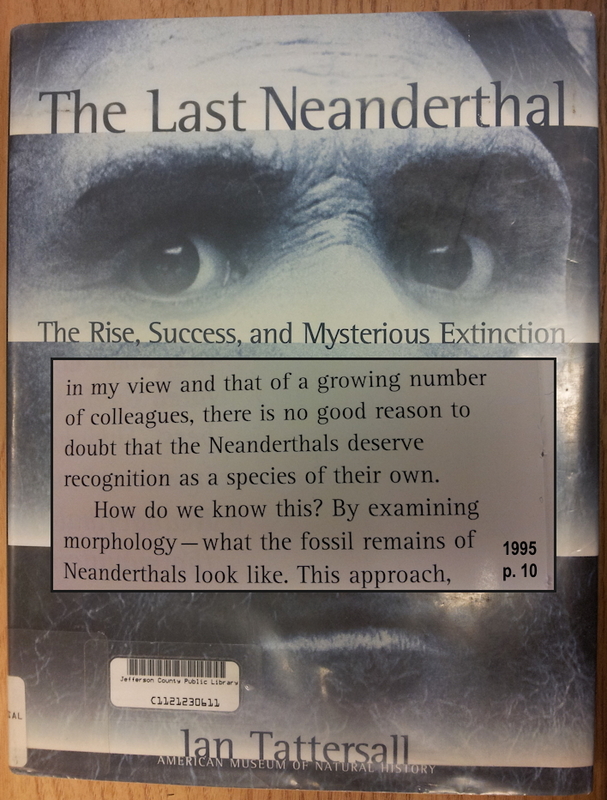 Neanderthals were MAN: Jack Cuozzo's 1979 museum work beginning in Paris is effectively a dated creationist prediction, as reiterated in his 1998 book Buried Alive, as are other creationists' writings. About three decades later, geneticists sequenced the entire Neanderthal genome and in 2013 they have doubly confirmed that Neanderthals used spoken language (of course), and with these scientific observations, they have confirmed the creationist prediction and proved wrong many of the world's leading evolutionists who had long claimed that Neanderthals were not Homo sapiens. The young age of the earth, and that life had to be specially created because it is information based, prove that Man was specially created and that there never was such a thing as an ape/human ancestor. Now, DNA proves that Neanderthal men and women were fully man, that is, they were Homo sapiens, because along with many other indicators, genetically they are closer to modern humans than two living chimps of the same species are to one another! Also, Dr. Cuozzo's work provides scientific reinforcement of the implication of Genesis that today's Homo sapiens age much more quickly than did human beings from a few millennia ago. * Two Chimps Are More Different than Neanderthals Are To Us: Regarding Georgia Purdom's report that, "two modern chimps of the same species will have more DNA variation than Neanderthals or Denisovans have to modern humans," see creation geneticist Dr. Robert Carter in the Journal of Creation 23(1) 2009, p. 40-43, The Neanderthal mitochondrial genome does not support evolution, along with Becquet, C. et al., Genetic structure of chimpanzee populations, PLoS Genetics 3(4):617–626, 2007, as reported at Science Daily and Kaessmann, H., Wiebe, V. and Pääblo, S., Extensive nuclear DNA sequence diversity among chimpanzees, Science, 286:1159-1162, 1999 as reported in a 2007 AAAS news release. * AiG Keeping RSR Informed: The current edition of the flagship publication of Ken Ham's Answers in Genesis presents a great series of caveman articles by David Menton, John Upchurch, Andrew Snelling, Mike Matthews, and Georgia Purdom, including as Purdom writes, "two modern chimps of the same species will have more DNA variation than Neanderthals or Denisovans have to modern humans." Taking the lead from Answers, RSR co-hosts Bob Enyart (above left) and Fred Williams (right) put themselves in a caveman's moccasins :) to figure out why Neanderthal (and others) lived in caves and why they looked so different. RSR believes that "Homo erectus", Neanderthal, etc., lived in caves only temporarily, to escape bad weather, etc., and they looked so different only because of ethnic differences which were often exaggerated by longevity. * 2017 Neanderthal Longevity Update: Papers in the journal Science report (corroborating this in today's RSR program) that Neanderthals matured slowly and had long lifespans. This and other discoveries are consistent with the relevant passages in Genesis, Exodus, and Leviticus. * Preemptively Correcting Evolutionists: Invariably, when evolutionists get proven wrong on a major prediction, even one in print for decades, atheist and other Darwinist listeners to RSR will claim, "Evolutionists never said such a thing." 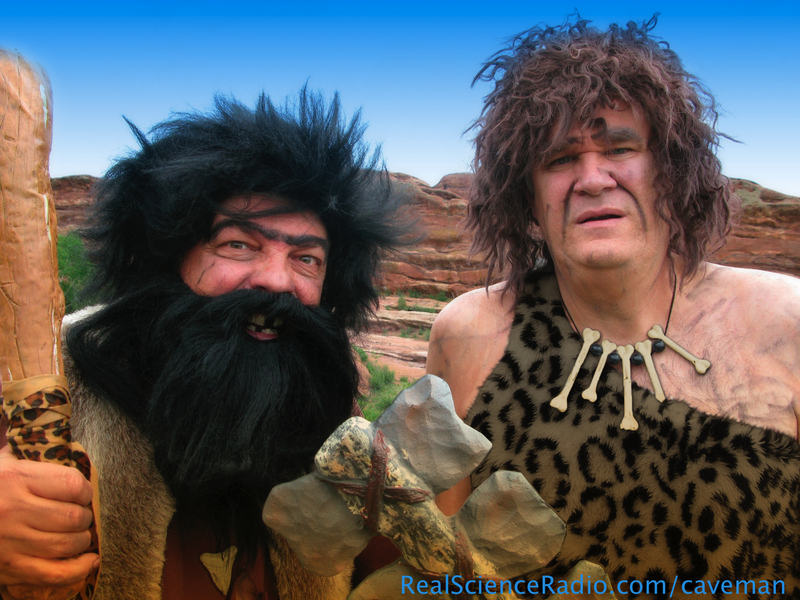 Even before our RSR Caveman program aired, the guys told an evolutionist about the Neanderthal sequencing, who replied, "Evolutionists never claimed that Neanderthals were a different species." So, to the evolutionists who post at EvolutionFairytale.com and at the BEL forum at TheologyOnline.com, before you accuse someone of making an error, it would help if you fact checked your own claim. 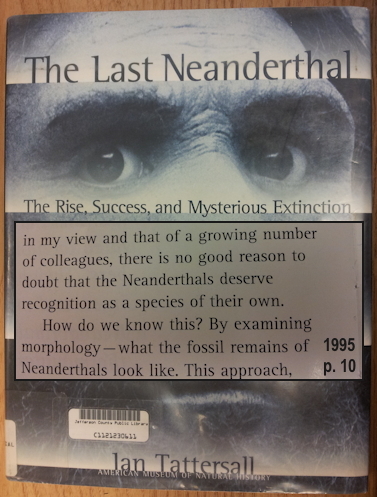 Preemptively today, Bob Enyart's 12-year-old son Michael found this 1995 book and checked it out of his local public library, The Last Neanderthal, a book sponsored by the American Museum of Natural History. The author, paleoanthropologist Ian Tattersall, described as "one of the most respected authorities on the subject," claimed that the word "'human' is extremely ill-defined," and that, "As used here, 'human' ... is more loosely employed to refer to all primates that share a common ancestry uniquely with us, from Australopithecus on." This is science by definition. It reminds us of the evolutionists who argue that we should simply "define" various domestic dog breeds as different species. Thus, like magic, by science by definition, they can then prove that speciation occurs commonly. Viola! On classification, Tattersall went on to say that, "in my view and that of a growing number of colleagues, there is no good reason to doubt that the Neanderthals deserve recognition as a species of their own." Except that they were not. And DNA doesn't lie. So Tattersall knew of no good reason, that is, other than that creationists disagreed with him. And since creationists have a better track record regarding scientific predictions, on those grounds alone Tattersall should have been more cautious. For then, he wouldn't have been falsified just a few years later on yet another major prediction from Darwinists. * Lucy, Tattersall, and the Neanderthals: Remember that the DNA of Neanderthal is closer to you, the reader, than is the DNA of one chimpanzee to that of another chimpanzee! Further, Neanderthal DNA is closer to modern humans than a chimp is to a chimp, even when comparing two chimps of the same species! So, with that information, note the bias that Ian Tattersall exhibits when he suggests that 3-foot tall monkeys like Lucy should be considered "human", yet he claims that the obviously human Neanderthal should be an entirely different species! For more information, see RSR's "The Lucy Show"! 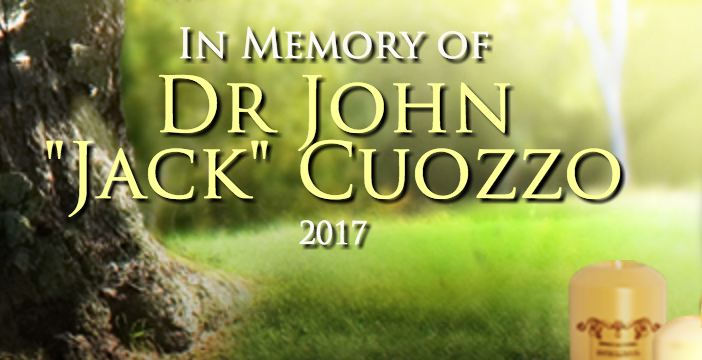 * Dr. Jack Cuozzo Is Now With the Lord: Dr. John "Jack" W. Cuozzo, longtime resident of Montclair, NJ died on March 23, 2017. Dr. Cuozzo was born on Sept. 1, 1937, and was raised in Glen Ridge, NJ (just south of where RSR's Bob Enyart grew up in Prospect Park). He studied at Georgetown University and obtained degrees from the University of Pennsylvania (D.D.S) and Loyola University/Chicago Graduate School of Dentistry. He served as a lieutenant in the U.S. Navy aboard the USS Enterprise CVAN(65). An orthodontist in the New Jersey area for 41 years, Dr. Cuozzo also served for two years as head of the orthodontic section and for two years as assistant director of the dental department at Mountainside Hospital in Montclair. He was also noted for his original research in the field of human origins from a biblical perspective and published or contributed to multiple books and articles in this field. His work was also featured on national radio programs (and on Real Science Radio) and he was invited to speak on his research at multiple venues across the country. See his full obituary here. * "Cavemen" were Ice Age People: 2013 Update: Click to see this "Neanderthal tooth" which was initially dated by the infamously inaccurate "rock layer method" to tens of thousands of years ago. Now, secular scientists have now used reliable scientific methods to date the tooth, and lo and behold, it belonged to a person who lived less than 5,000 years ago! Thank you, Lord for a world full of evidence affirming the Holy Scriptures! But back to the ice. But how do you get an Ice Age to start? Old-earth geologists have an impossible time trying to create a scientifically reasonable computer simulation that shows how an Ice Age could begin, for two opposing factors are needed: cold continents and warm oceans. Dr. Walt Brown's Hydroplate theory very directly explains how the Ice Age began! * Enjoy RSR via SoundCloud: Here's another way to listen to Real Science Radio on your smartphone or iPad. Just click for the RSR on the SoundCloud app! * The Pharaoh who Died Too Young: Dr. Cuozzo's work suggests that today's Homo sapiens age much more quickly than did human beings from a few millennia ago. Perhaps that observation relates to the following mystery from Egyptology regarding the pharaoh known as the "heretic" (i.e., the monotheistic) king of Egypt. In the introduction to The Papyrus Ebers, a knighted member of the Royal Society, G. Elliot Smith, wrote in 1930 of the mummy of Pharaoh Akhenaton (1353 - 1336 BC) that, "the anatomical evidence seemed to point to an age of about twenty-three (or at most thirty, if the process of development had been exceptionally delayed), whereas the historical evidence suggested that Akhenaton was at least thirty, and in all probability thirty-six years of age." Although this Pharaoh was born long after the Neanderthals, with the variable ways that genetic inheritance gets passed down (consider a savant that is severly disabled yet has some throwback to an earlier human brilliance), might Dr. Cuozzo's work be a factor in the understanding of this old mystery? * Two "Noah" Discussion Events: At 8 p.m Eastern Time both tonight with Ken Ham, and Monday night with Brian Godawa and Movie to Movement. Update: Thank you AiG for an important webcast! As a result of watching Ken Ham's program, Bob Enyart has decided to not see the movie Noah himself, and of course will not be bringing his kids to it, and RSR now recommends against seeing Noah, which portrays Noah as a psychopathic failure and God as worse. Further, AiG's valuable discussion suggests to RSR that the national ministries that recommended the movie were doing so to get praise from Hollywood, and not out of godly concern for children and families. Also, at 16 minutes in, Ken asks his panel, How do we answer the attack by atheists who say that the Bible God kills children. To hear the RSR answer, see When God Kills Kids.